0	0	The Little House That Stood DVD	In Stock - Order before 4pm for same day dispatchWant it on Tuesday 23 April? Learn to build your life on solid foundations with VeggieTales in a lesson in making good choices – ‘The Little House That Stood’. In this VeggieTales installment, Bob and his friends have turned their imaginations towards the world of nursery rhymes and parables. With creative flair and biblical grounding, these two stories will teach your young children to fellow the wise plan (the Bible) given to us by the master builder (God). The Vegetable builders – Bob the Tomato, Larry the Cucumber & Mr Lunt the Gourd – are constructing new houses in Cabbageville. Larry is using hay, Mr. Lunt is using bricks, but only Bob is laying foundations like the ‘Master Builder’s Handbook’ says you should. Time will tell which house will withstand natures test as a dangerous storm approaches. With catchy songs, quirky humour and three trendy pigs, children will discover who made the right decision and know how to make their own. The Mayor of Gooseville – Humpty Dumpty – is sick and tired of his job. Everyone comes to him for a helping hand: Little Bow Beep has lost her sheep, Goldilocks is hungry and every other fictional character is queuing up for help. His shell is beginning to crack under the stress, and so he goes on a vacation all by himself. Humpty soon discovers doing things on your own never works, and that being a helpful neighbour is the most important thing we can do. In the entertaining style of the Mother Goose books, every word rhymes. This DVD is Region 0, and will work in your UK DVD Player. 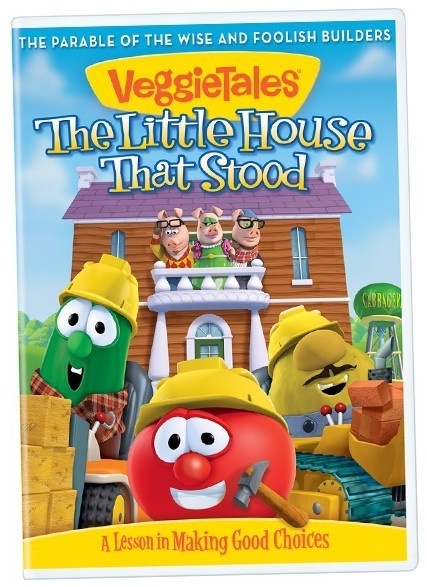 The Little House That Stood DVD by Veggie Tales was published by Authentic in March 2013 and is our 4324th best seller. The ISBN for The Little House That Stood DVD is 5060256820925. Little House That Stood is a delightful mixture of parable and fairy story, with the message that faith among other things needs to be built on strong foundations. Three little pigs arrive in Cabbageville and order new houses from three different builders. Two of these builders have very odd ideas about building with inevitable results. This story is followed by the usual silly song, this time Happy Tooth Day utterly ridiculous but little ones will love it. Good Egg of Gooseville the short film to finish is an imaginative tale based on the nursery rhyme, Humpty Dumpty, but nothing like you have ever heard it before and with its own strong message of helping others. I love these DVDs as can be seen from previous reviews. This is as good as all the others. Highly recommended. Got a question? No problem! Just click here to ask us about The Little House That Stood DVD. When the Three Little Pigs roll into Cabbageville looking to build some new houses, they meet one builder with a plan and two without a clue! Larry builds with hay, Mr Lunt with bricks, but only Bob builds his houses on a firm foundation - following the wise plans from the "Master Builder's Handbook!" Will the Little Piggies make the right choices when it comes to building their houses - and their lives - on solid ground? Find out in this parable that shows kids when they follow God's blueprints, they can stand strong when the storms come! PLUS! Ever wonder what happened before Humpty cracked? Find out in this very Veggie retelling of the classic Humpty Dumpty story, The Good Egg of Gooseville, where we learn that a good neighbour always "lends a little hand" to those in need! Perfect for Easter! Featuring the new Silly Song: Happy Tooth Day!